Lead stylist Diane Stevens for NIOXIN knocked it out of the ballpark with this fishtail braid updo for Korto Momolu. ● Place hair in a high ponytail. 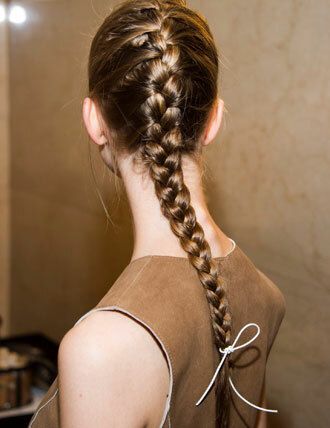 ● Apply NIOXIN Definition Creme to the pony and create a fishtail braid. 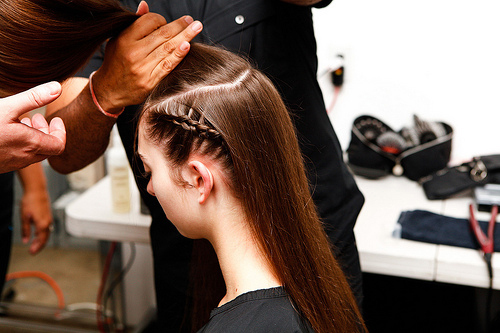 ● Twist the fishtail braid around the top of the head. ● Spritz with NioSpray Regular for hold. 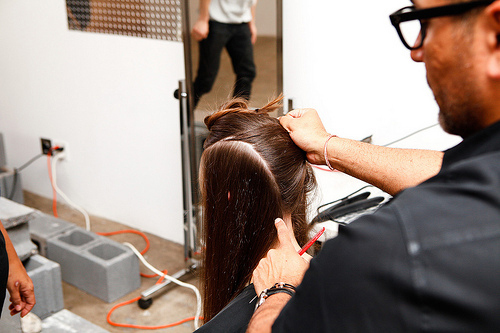 ● Apply CATWALK Sleek Mystique Fast Fixx Style Prep to condition and eliminate frizz. 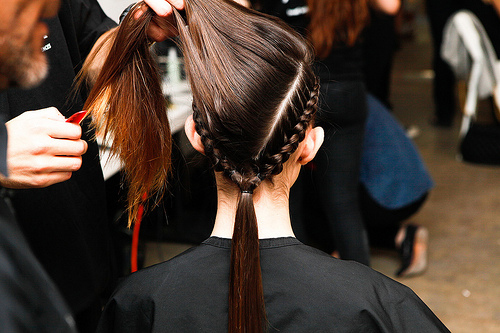 ● Section hair into five horizontal rows. 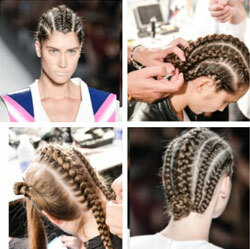 ● Reverse French braid each section moving front to back. 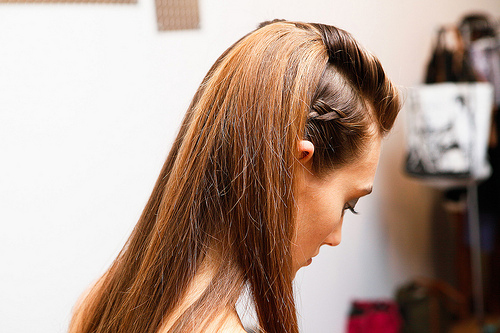 ● Secure each braid and spray with CATWALK Your Highness Weightless Shine Spray. 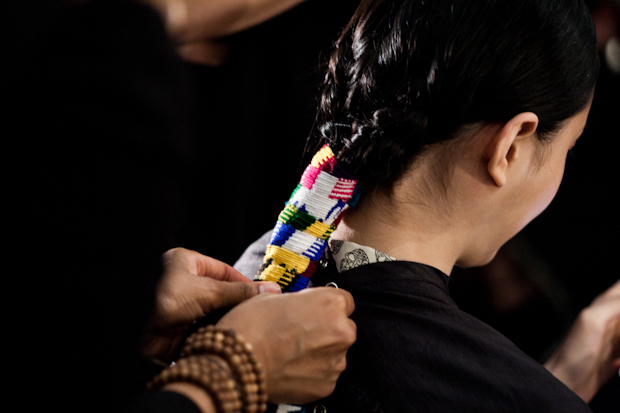 ● Gather and twist the braids at the nape to create a braided bun. 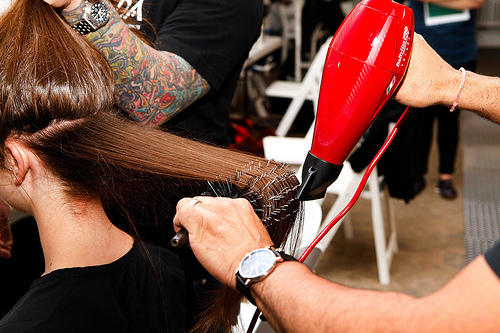 ● Lock the style with CATWALK by TIGI Sleek Mystique Look-Lock Hairspray. 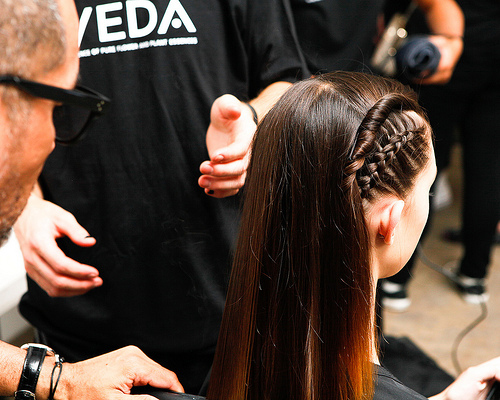 Aveda Global Styling Director Allen Ruiz created what he referred to as "urban street style colliding with shiny, modern elegance" for the Ann Yee Spring/Summer 2014 presentation. Yee was inspired "by the history of urban Detroit, Michigan - USA, its current crumbling economic state, combined with an appreciation for the survivalist spirit of the city as it moves towards a transformation. The collection entitled - Resurgence - revels in the structured, metallic elements of the auto industry and the draped, angular silhouettes of the city's weathered buildings against the skyline." 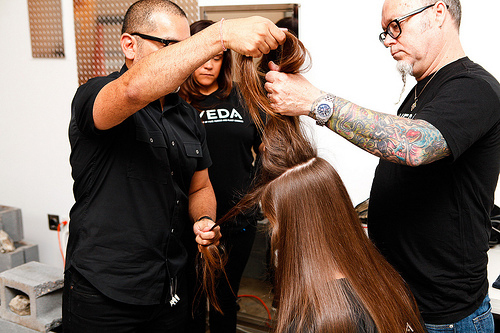 Step 1: Mist dry hair with Aveda Pure AbundanceTM Style PrepTM and blow dry straight with a round brush. 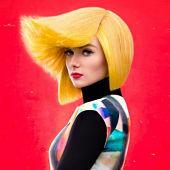 This will add the texture and grip needed to create this look. 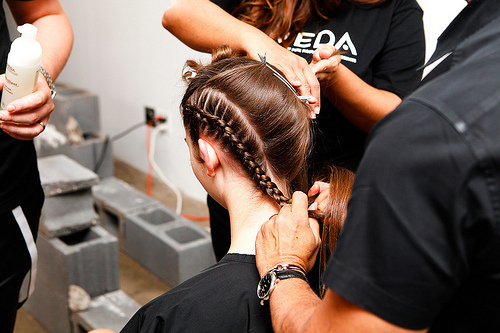 Step 2: Separate out 3 sections of hair (left, middle, right) and prep the 2 side sections with Aveda PhomollientTM Styling Foam to ensure a clean look that adds shine without build up or weight. 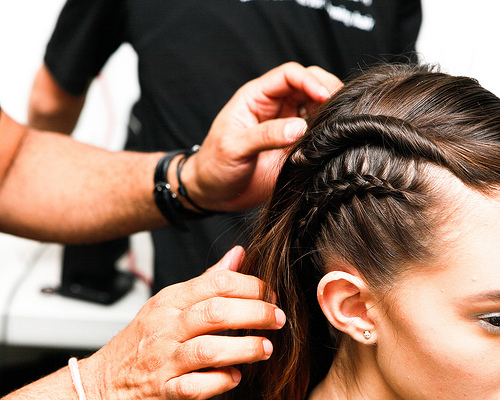 Step 3: Carefully begin to gather hair from the temple and form a tight, delicate braid down to the nape of the neck. Secure with a clear hair tie. Step 4: Repeat on the other side and tie both sections together at the nape of the neck. Step 5: Gather the top half of the middle section of hair and begin roll and pin into a structured twist that kisses the braid just behind the ear. Step 6: Flat iron the remainder of hair to fall over the shoulders and clear hair tie. 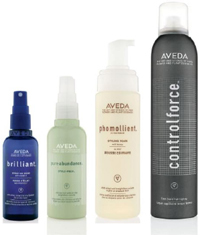 Use Aveda Control ForceTM Firm Hold Hair Spray to smooth hair into place for a firm, long lasting hold. 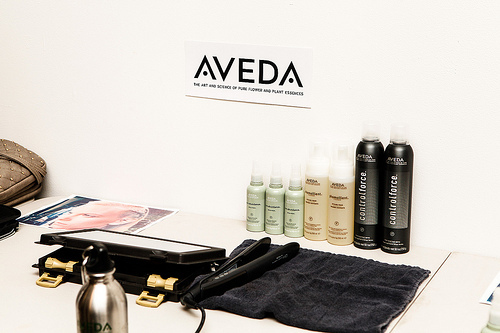 Step 7: Finish the look with a fine mist of Aveda Brilliant Spray on ShineTM to eliminate flyaways.